Born on 9 October 1870 in Ontario County, Ontario - husband of Inez[?] Wilhelmina Olver - at the time of his enlistment in 1915: trade as manager; married; currently a member of the Active Militia; no previous military service; Presbyterian; height of 5 feet 7 inches; chest of 37 inches fully expanded; fair complexion; greyish blue eyes; light brown hair. 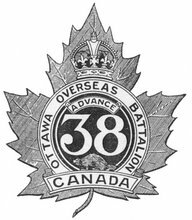 Joined the 38th Battalion, CEF, as quartermaster in Ottawa, Ontario, on 1 February 1915 - served with the 38th Battalion during its period of garrison duty in Bermuda - landed in France with the 38th Battalion on 13 August 1916 - struck off the strength of the 38th Battalion on 6 January 1919. Awarded the Distinguished Service Order - New Year award, 1919, no formal citation - unit recommendation dated 21 September 1918: "For continuous good work in the 'Llandovery Castle' and 'Scarpe' operations as Q.M. and Transport Officer." Awarded a Mention-in-Despatches - no formal citation - unit recommendation date 2 March 1918: "Recommended for 'Mention' for valuable services rendered in the Field and for displaying a conspicuous devotion to duty." Awarded a Mention-in-Despatches - no formal citation - unit recommendation date unknown, but announced 27 December 1918: no recommendation text. Promoted to lieutenant-colonel and assumed command of The Ottawa Regiment (The Duke of Cornwall's Own) on 1 May 1922 - relinquished command of the regiment on 1 June 1923.